EXClean-2000© is our proven gas cleaning technology which is able to convert the gases produced by the BASURAgas® Universal System to high quality SynGas. The raw gas flows through several processes of purification steps to achieve the defined final quality to specifications. The following purification steps are employed in each case depending on the fuel quality and the gas quality required by the further application. 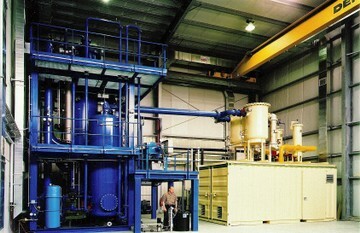 The produced SynGas is cooled from 600°C and up to 800°C, down to 120°C. During this process, cooling agents such as air, water, steam or oil heat-transfer units are used. The coolant agent is determined by the individual utilization of the generated excess heat. If the feedstock material moisture is too high for direct processing in the gasifier the excess heat is used for drying purposes. The rest of the excess heat can be made available for heating and cooling purposes in the surrounding area of the plant. The SynGas is afterwards slaked to 70°C with water. The coarse dust is removed from the SynGas while the gas is saturated with steam. Now the SynGas is washed with the “Venturi scrubber”. In this process the fine dust is reduced to less than 1 mg / Nm3. Dust, corrosive gas and heavy metals are being separated from the SynGas and shifted to the wash water. If the SynGas contains Sulphur, a separate biological gas wash is necessary which is placed downstream of the SynGas purification. It separates the hydrogen sulfide, which otherwise is not soluble, in wash water. This step contains the SynGas transfer and compression process to the required final pressure to specification, depending on the further application (which varies). Further SynGas cooling, condensation of the moisture content and mechanical drying is now achieved of the now pure SynGas to reach final specification. The SynGas condensates are separated and supplied to the wash water of steps 3 to 4. The last step is the separation of mercury from the SynGas by amalgamation in non-ferrous metal or in stainless steel catalysts. This is connected to an external downstream equipment for mercury recycling. The choice of the process strongly depends on the mercury content of the feedstock materials. The SynGas can be extra purified after step 1 to 7 by using different molecular strainers according to the intended usage of the SynGas. Accordingly a partial or close to an entire separation of carbon dioxide, water or hydrogen sulfides can be achieved to allow special usage of the SynGas. The main advantages of the wet SynGas purification by our gas cleaning equipment lies in the shift of the acid production (fluorine, chlorine and Sulphur) as well as the alkalizing elements (heavy metals like lead, zinc, cadmium, etc.) in the wash water of the SynGas scrubber. In the process of the BASURAgas® Universal System these materials are produced mainly in basic and not in an oxidized form. In addition, the gasification process reduces the nitrogen that is contained in the feedstock materials to ammonia. During the gas scrubbing process the ammonia is bound as an ammonium in the water and leads to a very basic wash water (pH factor from 9 to 12). Thus, the heavy metals do not dissolve in the wash water and can be filtered through simple sludge removal (centrifuge, filter press) from the wash water. At the same time the ammonium serves as a neutralizing agent for chlorine and sulphur which supports the recycling of those valuable materials. Chlorine: Chlorine reacts with ammonium and becomes ammonium chloride which can be sold as a cleaning agent. Sulphur: Sulphur reacts with ammonium to ammonium sulfate and can be sold as a nitrogen fertilizer. Heavy metals: Since the heavy metals exist in a basic form, they can be melted down for material recycling. The perfect combination and optimized steps of the SynGas and wash water processing, results in nearly an entire recycling of all elements contained in the feedstock material. Valuable materials will be recycled during the conversion. No valuable residue from the original feedstock material stays behind.